an interesting feature in her excavation unit during 2012 Dig. Northcentral Chapter 8 of the Society for Pennsylvania Archaeology, in cooperation with Lycoming College’s North American Archaeology Department and volunteers from various community service groups, have completed the second year of excavations at the Glunk Site in Loyalsock Township, Lycoming County. Located on Bull Run near the Susquehanna River and approximately one kilometer west of Loyalsock Creek, this site is owned by Paul Glunk. Although it is in close proximity to the Ault, Canfield Island, and Bull Run sites, excavated by NCC8 under the supervision of Jim Bressler, this particular parcel of land has never been excavated. To say that this is a choice location for all things archaeological may be an understatement. The entire Bull Run estuary seems to be a hot bed of prehistoric and Contact Period Native American occupation. Test pits were done last year to determine if the present location was promising, after a generous amount of pottery sherds and debitage (chert flakes) were found, it was an easy decision to dig there. Also in our favor, the site had been partially cleared by the owner to begin a land reclamation project. We were only approximately 50 yards from The Ault Site (Bressler’s palisaded Shenks Ferry Village), however, and did not know for certain if this would be a continuation of that dig since the perimeter of the village had never fully been determined. When bagging artifacts and preparing reports, we preliminarily used the Ault Site’s Pennsylvania Archaeological Site number 36LY120. After this second year, however, we are fairly certain this site falls out of the village proper and are now in the process of applying for a new Pennsylvania Site number to differentiate the present dig from surrounding sites. 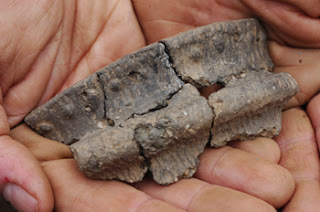 Artifacts uncovered at the Glunk Site confirm a rich Late Woodlands Period occupation, as well as isolated Early Woodlands and Archaic Period artifacts spanning 3000 B.C. to 1450 A. D.
There are two major prehistoric cultural groups represented at the Glunk Site: the Clemsons Island People, 850 A.D. to 1250 A.D.; and the Shenks Ferry People, 1250 A.D. to 1450 A.D. There can be no doubt of their presence here because of the large amount of identifiable pottery, projectile points and stone tools discovered during the excavation. The stratigraphy (profiled soil levels laid down by natural process and human occupation), thus far, seems to be consistent when compared to Bressler’s earlier digs, with recent deposits of river mud and a plow zone ( historic lumber mill strata) dominating the top 16 inches. The Shenks Ferry and Clemsons Island layers ( a much lighter sandy soil ) fall directly under that first level and extend consistently to approximately 30 inches and even deeper when a refuse pit was encountered. Clearly visible historic ditch digging and other soil disturbances, including those same refuse pits, have mixed the levels to a great degree and sometimes accounted for artifacts being found out of known levels. The excavation, at this point, has uncovered artifacts belonging to six cultural groups: Brewerton and Conodoquinet/ Canfield both of the Archaic Period and Jacks Reef, the Clemsons Island People and Shenks Ferry People as well as an unnamed culture producing a teardrop point (perhaps a New Jersey area origin) within the Woodlands Period. The only major Late Woodlands culture we have not found represented is McFate- Quiggle (coming right before Contact). Artifacts of these people have been found all around this area at Canfield Island and the Ault Site, but not here as of yet. The presence of post molds and signs of structures have thus far eluded us. There are, however, many fire pit features within the first 12 excavation units, and seems to be, as I have stated several times to the volunteers, “a great place to camp”. It is an amusing and completely preliminary assessment and with further excavation I’m fully prepared to be proven wrong. So far though, it would appear that indeed there are no wigwam or long house remnants. Perhaps they built fires to cook and to produce pottery outside of the village or to sit around a fire on a clear evening to make projectile points. 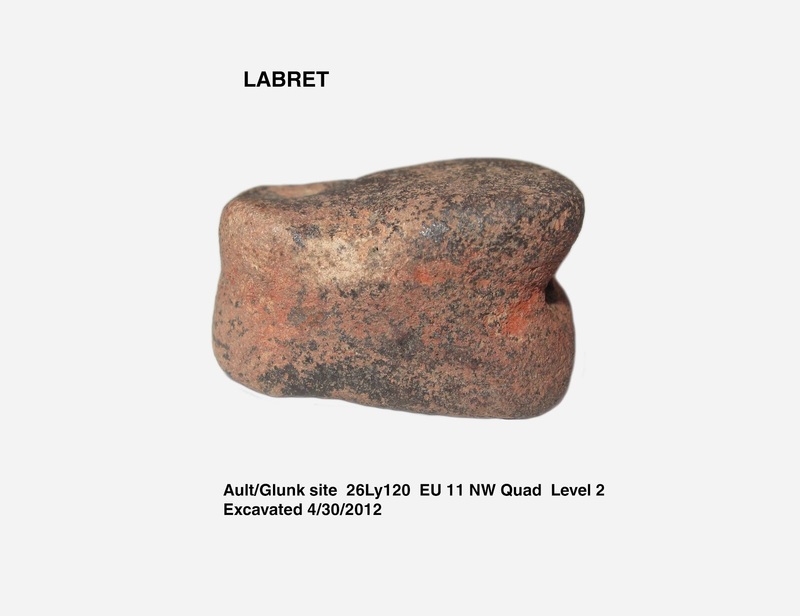 As stated earlier, the Glunk Site is a rich prehistoric site in terms of artifacts. These include hundreds of pieces of pottery and debitage, stone tools such as hammerstones , netsinkers, a broken gorget (adornment or protection piece for the neck), at least one broken pestle, projectile points (arrowheads and spear points) and fire-cracked rock. To this point there are no identified Contact Period artifacts (A.D. 1500-1750) from tribal groups that moved through the West Branch during the convulsive times of colonial expansion. EU 5 -- A clearly packed and stained living floor at 23 inches in depth produced a remarkable find of two cultures. Two projectile points -- a Jacks Reef point (a Central New York tribe) and a Levanna-style point (the Clemsons Island People) were found literally side by side. If the point was not acquired in trade, perhaps it may have been a neighbor visiting from the ancestral home of both cultures. EU 2 -- This unit produced one of the digs mystery finds. Within the Clemsons Island level we found a very unusual rimsherd. Although marked with punctates (dimples made by pressing the soft clay with a stylus) and unmistakably belonging to these people, this variant has a heavy lip going all the way around the pot. At first we thought it might be a handle but further pieces were found this season and confirm that it does, in fact, ring the pot. When shown to State Museum artifact experts Jim Herbstritt and Doug McLearen, we were told this style of pot has not been seen in this area before and that it is unique to the culture. 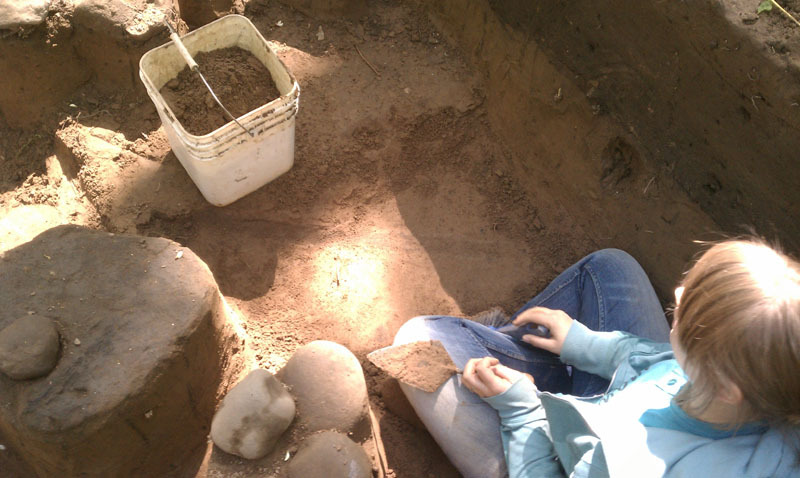 They did assign a date to the pottery of 1050 A.D.
EU 11 -- An object found and researched by Lycoming College student Shana Eichenberg and also examined by State Museum experts has proven to be inconclusive at this point. 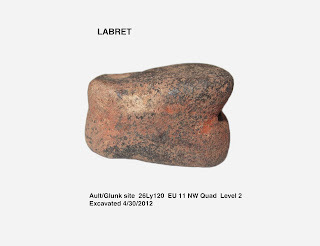 This object looks very much like a labret, an adornment piece worn by ancient Native Americans. Examples have been found in Alaska, the Pacific Northwest, Illinois and Florida but never in the Northeast. We will try to find have this artifact examined by experts in the states where they are found. NCC8 has now optioned to fill in the first 12 excavation units. At a depth of over 60 inches and with no significant evidence of older Archaic levels we feel confident that this has been primarily a Late Woodlands experience. Besides, a large hole in the ground is a safety issue for man and beast. We have opened three new units on the west side of the older units and will continue work in the spring of 2013. As for this winter, we are beginning the work of cataloging and cleaning what we have unearthed over the past two years and need volunteers to help in the process. Two Lycoming College students, Shana Eichenberg and Aaron Rubin, will catalog artifacts as part of student internships in Spring 2013.